This poem is the reason I became a life coach. Imagine a fish so far from his watery home that he’s riding a camel in the desert. I’ve known this thirst and I worked hard to quench it. 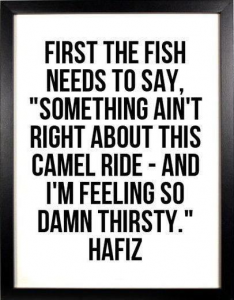 And then I set out to help other fish who are feeling “so damn thirsty”. It can be tempting to continue that camel ride, no matter how uncomfortable. We can tolerate a familiar thirst for a loooooong time. The brave riders stop and say “What the hell? How did I get HERE?” and begin to look for where and what they are meant to be. Yeah, I’m talking to you. Yikes. This idea may not initially evoke a sense of calm — but you can’t quench your thirst if you’re hiding from it. And actually, the truth is not scary. What’s scary is the chaos and disorientation that follow the truth. What is true right now? Figuring out what isn’t working can be a good start. 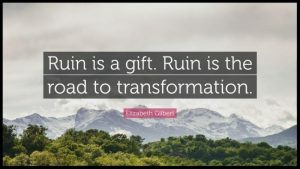 What is ruined or turning to ruin? It could be a small truth such as “I don’t want to spend time with my bossy sister-in-law” or a big truth like “I hate my soul-sucking job”. Take a few moments to become still — and find a truth about your life. And exhale. The truth may not be what you want it to be, but it’s the way things are. Once you acknowledge what is ruined, your brain will start looking for ways to fix it. The brain is a phenomenal computer that will build new ideas by combining the unsolved parts of a problem with information stored in your memory. This means that you can prime your brain to work on solutions, even when you aren’t actively thinking about them. Being honest more often will also help you to feel peaceful more often. EVEN IF YOU HAVE NO CLUE WHAT TO DO. Avoiding the truth is what exhausts and disorients us. The peaceful feeling we crave arises when we stop resisting what is true. And you’ll surely make better decisions when you’re peaceful. I’ll be fine if it doesn’t work out. You’ll be fine if it doesn’t work out. Simple words. Tremendous meaning. What if you just decided that you were going to be fine no matter what? You’d probably do a lot of things differently. You’d test your boundaries. You’d trust yourself more. The trick is that feeling this way is just a choice you make. You decide to believe it or not. Too many people… feel like they’re on a tightrope suspended 50 stories up. One wrong move and they’ll fall. But that’s not the case. The people who believe they’ll rebound have a lot more power. Your mindset dramatically affects how you feel and behave. For this to work in your favor, be intentional about what you think. YOU ARE THE BOSS OF YOUR BRAIN so direct your thoughts in ways that help you. You can reinforce this “I’ll be fine” mindset by remembering times when things didn’t work out and you were able to rebound. I faced the ruins after 9/11. My husband-to-be received military recall orders to serve a year in Afghanistan. 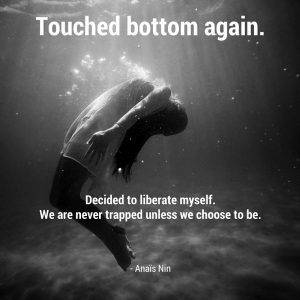 When I most needed support, my best friend and I broke up. I also started a new job in luxury travel — an industry that was nearly devastated by the 9/11 attacks. The company I joined was in a crisis and layoffs were necessary. I couldn’t move without bumping into fear and I wanted my old life back. I can’t prove it — but in order to stay sane, I’m endorsing the idea that “nothing just happens”. 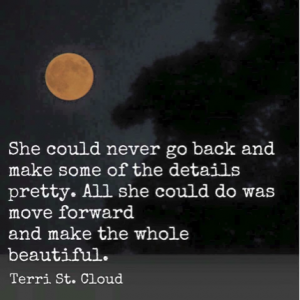 There’s no guarantee that everything will come out smelling like a rose; however, I believe we’re often guided to learn a helpful lesson or connect with certain people. In my case, I met my new best friend at that travel company. Thankfully, she served up the bottomless compassion I needed to keep going. The surprising news is that we often find our destiny in the middle of the worst time. The ruins will take you down a different path, your destined path. If you believe that you are being guided, the desert won’t be the end. It will be the beginning of the journey to quench your thirst. Freedom and clarity are waiting for you on this path. 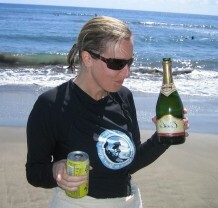 And that will be refreshing…no matter what. Check out this hilarious cartoon: 3 Things I Learned From My Life Coach. If you suspect that coaching is about trust falls and positive affirmations, it’s for you. 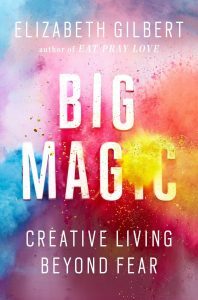 I finally got around to reading Big Magic: Creative Living Beyond Fear — and it was delicious! To keep the magic alive, I also devoured Liz Gilbert’s podcast, Magic Lessons. She talks with experts as well as creatives who are struggling to get their work into the world. 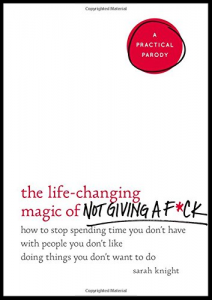 Next on my reading list: The Life-Changing Magic of Not Giving a F*ck: How to Stop Spending Time You Don’t Have with People You Don’t Like Doing Things You Don’t Want to Do. Haha! 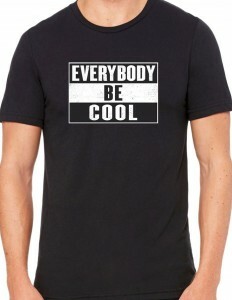 And lastly, I created a new t-shirt for my peeps!! It speaks for itself. This entry was posted in Change, Deciding, Peace. Bookmark the permalink. ← What Master Coach Training taught me.